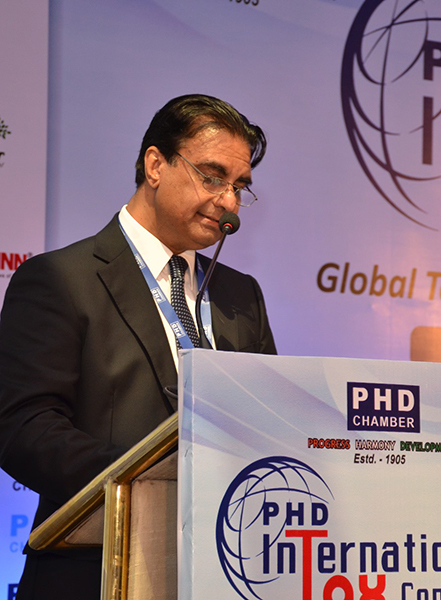 In his capacity as the Chairman, Direct Tax Committee, PHD Chamber, our Managing Partner, Mr. Anil Kumar Chopra was the Convener of the “PHD International Tax Conference – Global Issues & Recent Developments.” The Conference initiated an informed dialogue on important issues of International Taxation and Indian Tax laws to propagate a more effective, clear, stable and efficient tax regime that would promote Foreign Direct Investment and Cross Border Trade. The two-day Conference served as a premium platform for sharing and exchanging knowledge and was well attended by Senior Government Officials, Eminent Tax Experts and Professionals. Representatives of Embassies & High Commissions including USA, Japan, Russia and Australia as well as eminent tax experts from Singapore & Hong Kong spoke at the conference addressing global issues. There was an in-depth discussion on important tax issues of current interest including Transfer Pricing, Cross border Investments, Mergers & Acquisitions , Base Erosion Profit Shifting, Exchange of Information and Black Money (Undisclosed Foreign Income & Assets) and Imposition of Tax Act, 2015. Mr. Anil Chopra chaired two key sessions of the conference being “Black Money and Imposition of Tax Act’ 2015” and “Vision for India from a tax perspective to make India a preferred investment destination.